I could never make a good sambhar. However with time, trial and error I can now make a fairly tasty sambhar. This is my version of a sambhar. Take above ingredients in a pressure cooker and cook on medium flame for 2 whistles. Immediately place cooker under running tap to condense steam and reduce pressure and then open the cooker. Do not overcook the dal. 1. 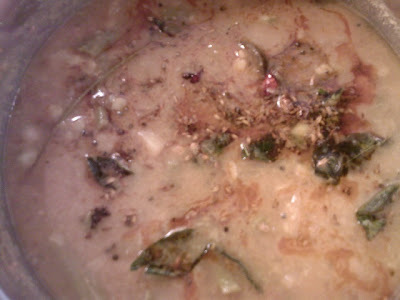 In seperate vessel boil together the above vegetables with salt, sugar, sambhar powder, chilli powder, tamarind extract. Cook till just done( may take 20-25mins). 2.Add cooked dal and drumsticks to the cooked vegetables. Pour over sambhar. Serve hot. Simple Chicken Curry with Potatoes without Coconut.